John Steinbeck once wrote that the Amalfi coast “isn’t quite real when you are there and becomes beckoningly real after you have gone.” Having visited it last summer, it still doesn’t seem quite real to me, but that dreamlike beauty does beckon. For those of you planning next summer’s travel, or just wanting a taste of seaside sun now, here are a few photos that capture some of this magical place. Most are my own, but a few I’ve gathered elsewhere. 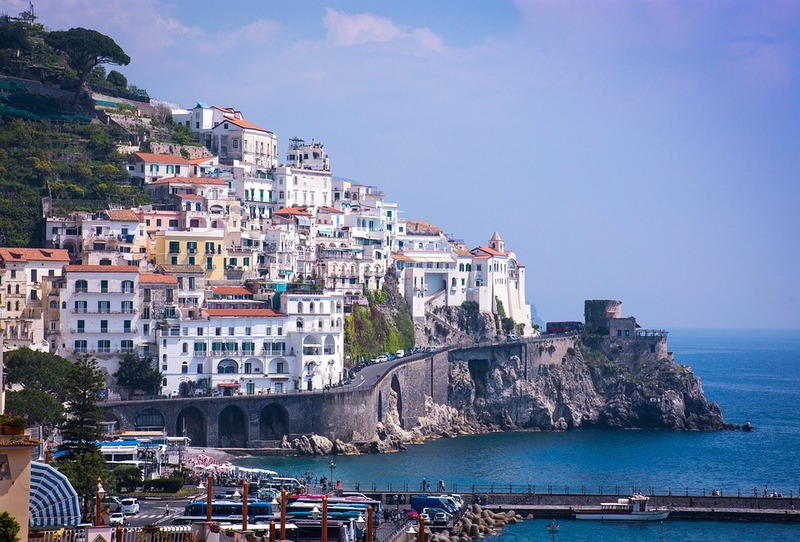 We start here in the town of Amalfi, where we stayed in the Hotel Residence, across from the waterfront and a sandy umbrella strewn beach. Around the corner from our hotel is a large plaza with steps climbing toward a striking Byzantine cathedral and a fountain where passersby fill up their water bottles. Narrow streets lead away through a busy shopping district into the foothills. The next day we leave Amalfi, catching a ferry to Positano, one of the most beautiful towns along the coastline. On the way we catch glimpses of other seaside villages and villas clinging to the rugged hillsides. Here we arrive at Positana, which grew around a Benedictine abbey founded in the 9th century. Now the tiled dome of the Collegiate Church of Santa Maria Assunt is its most famous landmark. We walk along the waterfront, where artists have set up their easels and a marching band entertains us. and then have lunch with a view of the seaside. Later we stroll up into the hills to shop, and enjoy the spectacular views above and below us. Along the Almafi Coast lies the island of Capri and the city of Sorrento, which we also visited. But I’ll save that for another time. Deborah, thank you for this beautiful tour!!! Never seen photos like that from such an involved perspective. Makes me want to go there one day. Looking forward to your next posting, on Sorrento on the Island of Capri. Ciao! Thanks, Ken! I’m sure you would love it. Go a little earlier in the year though. Very crowded and HOT in June! Oh Deborah – you got to be there! I wonder: is the inspiration still lingering in your (he)art from the time spent there? It is, Laura, more in my heart than my art, so far. I’ve worked on a couple of paintings from photographs I loved but nothing worth sharing at this point. I needed these views today. Still hip deep in snow in the Great White North. I’m glad these helped, Susanne. We’re finally getting past the much needed downpours here in California and so nice to see some sun again. I’m glad you enjoyed these, Mackenzie. I hope you do too and share on your blog, along with your photos from Bora Bora!